♥ Thank God for seeing me through another week, and giving me much joy and strength in Him daily. ♥ Thank God for His many mercies in preserving my younger brother who just went through 2 surgeries within the last 2 weeks. He went for a surgery 2 Fridays ago at the General Hospital, Malaysia, to remove some kidney stones. His recovery has been very slow and he has been very weak and sickly. A few days later, the hospital found out that he is suffering from some form of internal bleeding. They have done some scan and given him blood transfusions. The scan reveals that he has a growth at his kidney and the laser treatment during the surgery to remove the kidney stones has accidentally punctured the growth and it was bleeding. The doctor has tried to use some medication to stop the bleeding but it didn't work. A second surgery was needed to remove the growth and stop the bleeding. Last Friday the General Hospital decided to transfer him to a Specialist Hospital as the General Hospital does not have the expertise to deal with this issue or do such a surgery. ♥ Thank God that my brother went through the second surgery successfully at the Specialist Hospital last Friday. After my brother's second surgery on Friday, he was still rather weak because he has lost a lot of blood over the week and he couldn't eat much as no appetite. He was still on blood transfusion on Saturday (the 8th packet). Due to the eternal bleeding, he has blood clot in his urinary tract and experienced great pain whenever he passes urine. He was also breathless and unable to talk much. But thank God that he has improved significantly now! He is no longer in pain, able to talk and eat better. ♥ Thank God that my brother is recovering well now and may be discharged within a few days if he continues to recover well. He spoke to me briefly over the phone and told me of how he suffered tremendously over the last 2 weeks and he is going to cherish his life and the people around him more in the days ahead. He also shared with me that there are many wonderful things happening in the midst of his sufferings. He said the people around him were exceptionally kind to him. He has several room mates who are Christian and daily their pastors and fellow Christians will come and read the Bible, sing and pray with them. He said he was somehow very troubled after the first surgery even though the Surgeon told him that his first surgery was very successful. He suffered much after that due to the internal bleeding. When he was told that he need to go through a second surgery, he began to experience peace. He said when he went for the second surgery, he found something very strange. The scene and the happenings at the second surgery has appeared to him in a dream before in the past and he remembered that in his dream after the second surgery the Surgeon asked him whether he is a Christian. My brother said the strange thing is that indeed after his second surgery the Surgeon asked him whether he is a Christian! ♥ Thank God for His mercies to my brother and in working wonderfully through the people around him and even through his dream. I asked my brother to reconsider his life and to seek the Lord. Please pray with me for God's mercies upon his soul in this difficult time. He is not a believer but have heard the Gospel many time. He believe there is a God but unable to believe in our Lord Jesus Christ as his Saviour. 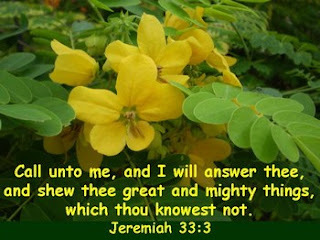 I know the Lord has not opened his heart yet. He is very involved in the religion called "The Heavenly Way" or "Tien Dao". Pray that through this trial he may be led to consider his life and his need of a Saviour. ♥ Thank God for one of my friends who has contacted a pastor in Malaysia who might be able to visit my brother. Please pray that if God wills, He will open the door for the Pastor to visit my brother. I am unable to visit my brother because I have to take care of my mother who has many health problems. My brother is very faraway from my mother and I now. He is staying in another country ie Malaysia. Thank God that His people are everywhere and God can use His people that are near to my brother to minister to him. Please know that I will be lifting prayers to the throne room of God for you dear brother. He has been through alot, and we need to pray for rest, restoration and healing. How are you holding up friend? My dear friend, I am praying for you, and your brother. I love you. I am praying for your brother. Nancie, we will continually lift you and your loved ones up in prayer. It has to be very difficult to have your brother so far away. We send you lots of love and hugs. I will be praying. Sounds like he has been through quite an ordeal. Thanks, Lorie, Denise, Wendy, Darlene and Michelle, for your prayers and encouragements. Thank God for His mercies that my brother, Daniel, is discharged from the hospital and is now resting at home! Thank God for preserving my brother's life and restoring him. I just posted more details about it on my post today. Do read my post and thanksgiving to God. I thank God for your prayers and encouragements during this difficult time. It means a lot to me as this brother is very dear to me. I thank God upon every remembrance of you. Please continue to remember him in your prayers for his salvation and restoration. Just read this, Nancie, I'll be praying for your brother - that he recovers physically and also that, through all this, he comes to know our Lord and Savior. Thanks, Marja, for your prayers and encouragements! I am praying for you too as you prepare to speak to the Support Group. May God bless your session with them. Take care and God bless!